This pie is a delicious recipe for leftover roast turkey. Serve with mash or bubble and squeak. Heat the oil in a frying pan over a medium heat. Fry the bacon lardons until crisp. Remove the lardons using a slotted spoon and set aside. In same pan, fry the onions and garlic for 5-6 minutes, or until golden-brown and softened. Add the remaining ingredients, except the egg and pastry. Bring the mixture to the boil and simmer for 25 minutes. Set aside to cool. 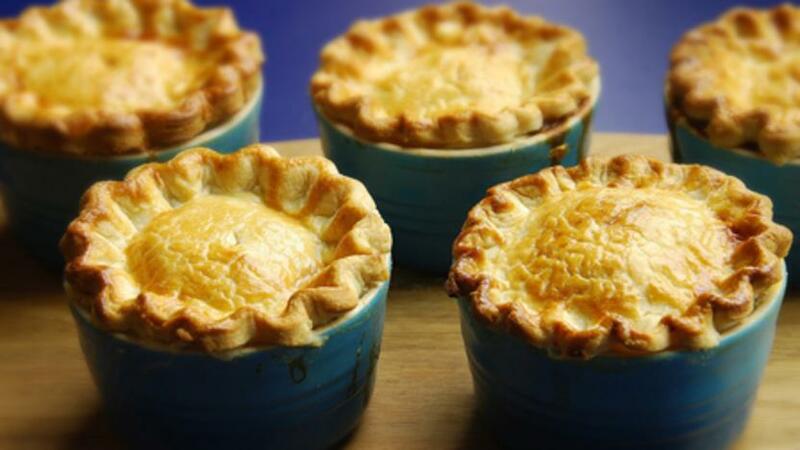 Divide the mixture between four individual pie dishes. Cut the pastry into four pieces, each big enough to cover the pie dish. Brush the edge of each dish with egg wash and cover with the pastry. Trim any excess pastry and brush the lid with the remaining egg wash.
Cook for 20-25 minutes until the lid is crisp and golden-brown.